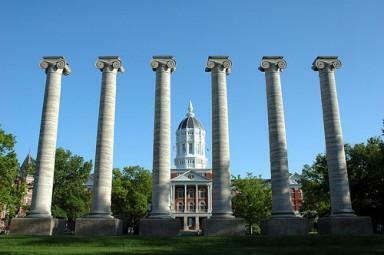 The University of Missouri is now officially looking into a new athletic conference affiliation. At a press conference following a nearly four hour closed door meeting last night in St. Louis, University of Missouri Board of Curators Chairman Warren Erdman said the vote was unanimous. “The board of curators delegates to chancellor Deaton the authority to take any and all actions necessary to fully explore options for conference affiliation and contracts related thereto, which best serve the interests of the University of Missouri Columbia and the University of Missouri system,” Erdman said. Which is a little awkward for the aforementioned Chancellor Brady Deaton, since he headed the big 12 board of directors up until last night. “I’ve relinquished my role as chair of the Big 12 board of directors in order to focus more fully on MU’s best interests,” Deaton said. A reporter asked Deaton about the nature of MU’s relationship with the Southeast conference and whether it had an offer from the SEC. Deaton said he would not make comments about any specific conferences during this process, and also said it was too early to give a timeline of when a decision might be made or what kind of financial penalties MU might face if it leaves the Big 12 conference. Interim University System President Steve Owens said the meeting took four hours because the curators wanted to give this decision its due diligence. “What brings us here tonight is that the Big 12 conference is now requesting its members to make binding, long-term, irrevocable commitments to the conference. We don’t fault the Big 12 conference for asking for this. It’s something it should be doing in order to promote stability. But because we are currently faced with making a long-term commitment to the Big 12, now is the time to explore our options to fully understand where we are before locking into a long-term commitment,” Owens said. Deaton said MU does not have a deadline to make that commitment to the Big 12.